Every year, I take all of my “Done” tasks in my daily work log, normalize them, and run them through a word cloud visualizer to see what I’ve been spending my time doing. This helps me as I write my annual self-evaluation and generally reflect on how I should spend my time in the coming year. It doesn’t have a lot of nuance, though — things that repeat a lot are bigger, even if they don’t loom large in my head. This year’s word cloud similar to last year’s in that I spent time on regularly occurring activities, such as staffing the Reference Desk and reference chat, being in meetings, emailing people, and teaching/prepping for teaching. researchleave — this was my first year on the tenure track, and I spent about 4 days a month on RL, which is granted to junior faculty members at CUNY. I spent most of that time gathering data for a web preservation survey project, learning new tech skills for use in an NLP project, writing my Internet Connection column, and writing proposals (my PSC-CUNY grant proposal was accepted!). drupal, mockup, update, usability, and webcommittee — our library website just underwent an interface update 7 months in the making. I chaired the library’s Web Committee, made mock-ups, gathered feedback, designed and moderated usability tests, and implemented UI/UX changes on our Drupal site. I also updated a lot of content and promotional materials on the website, a continuous job. workshops — I’ve come to realize that running workshops is one of my favorite professional activities. Library basics, Python skills, teaching tips — I love it! I ran a handful of workshops this year aimed at students and at faculty, such as my very well-attended “Privacy tips & tools” workshop. oer — I spent a fair amount of time this year reading up on Open Educational Resources, before and after attending OER17 in London. teachingandlearningcenter — I was part of a year-long, very good “Online/digital teaching” seminar at John Jay’s TLC. In 2017-18, my intention is to use my research leave time better and more productively. 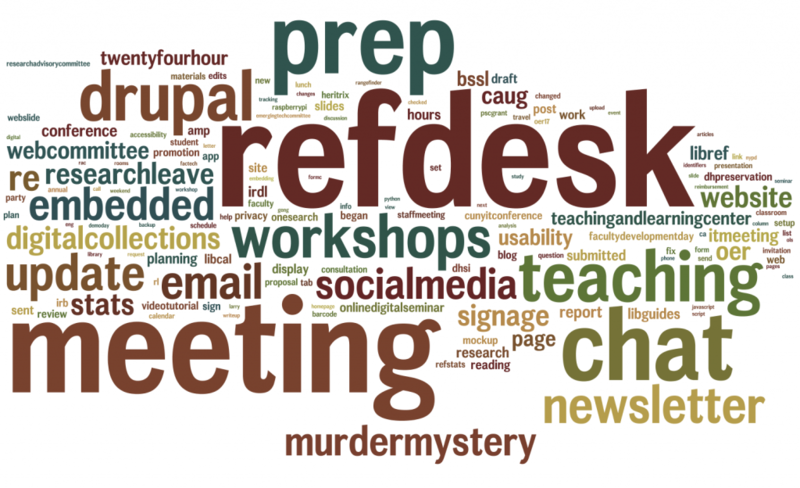 I’ve gotten better at time management in the office (see: the rising prominence of “prep” in these annual word clouds), but I need to build up better habits on my own time, too, as I work on my solo projects. This might also point to a need to collaborate more with other scholars/practitioners — I’m at my best and most productive when working on a team. Looking again at last year’s “What did I do this year?”, I see that I’d intended to carve out more time for reading. I did do some of that during my research leave, but I have to be a lot more intentional about it or I’ll just focus on hands-on activities. I jump-start my annual self-evaluation process with a low-level text analysis of my work log, essentially composed of “done” and “to do” bullet points. I normalized the text (e.g. emailed to email and Digital Collections to digitalcollections), removed personal names, and ran the all “done” items through Wordle. What did I do at my job this year? teaching: I taught a library instruction session (“one-shot”) in 16 on-campus classes and 5 online classes. I taught twice as many classes as I did last year. socialmedia: I post things on Twitter and Facebook, along with several colleagues. I run the Instagram account all by me onesy. murdermystery: I ran this super-fun activity in the spring semester and began preparing for a summer session. 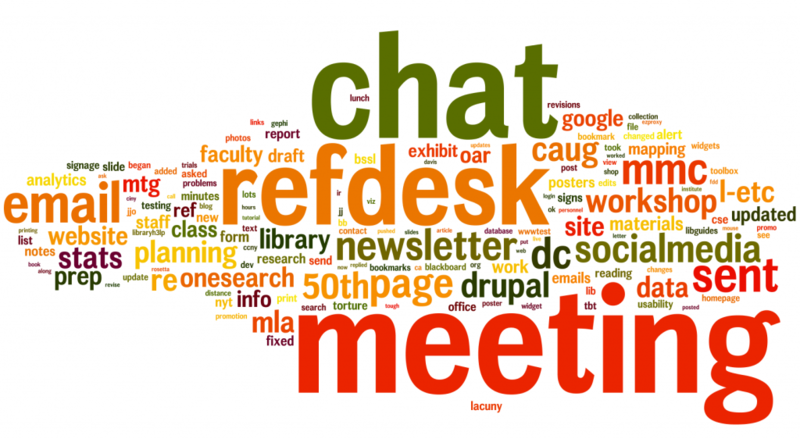 refdesk: I staffed the Reference Desk for 105 hours. drupal, digitalcollections, and onesearch: Worked on web stuff that runs the library websites. I also emailed a lot and had a lot of meetings. What’s also interesting is how much I used the word prep. This is often related in the work log to teaching, and I did teach double the number of classes I taught last year. But I think it also reflects an improvement in my time management skills! I am also trying really hard to carve out more time for reading. At work, I mostly read articles and blogs related to the intersection of technology and library practices, with a healthy dose of DH and privacy activism. I jump-start my annual self-evaluation process with a low-level text analysis of my work log, essentially composed of “done” and “to do” bullet points. I normalized the text (e.g. 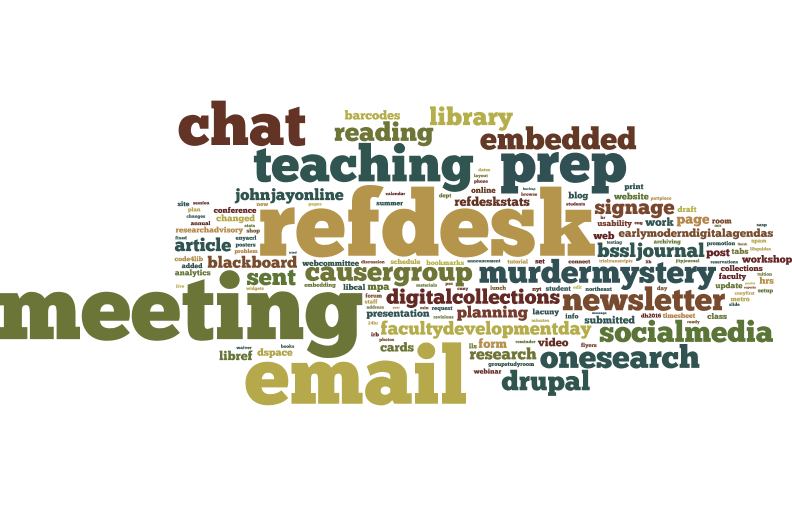 emailed to email), removed personal names, and ran the all “done” items through Wordle. 2014–15 was my third year in my job and the third time I did this. (See 2012–13 and 2013–14). I do this because it can be difficult to remember what I was up to many months ago. It’s also a basic visualization of where my time is spent. What’s on tap for 2015–16? Lots of online education outreach and much more instruction than I’ve previously done! I’m also starting to flex my writing muscles, starting with a quarterly column in Behavioral & Social Sciences Librarian. It’s self-evaluation time again! It’s the second year I’ve had to do this for my current job. Last year, I found it enormously helpful to quantify and visualize the activities I’d done in the given time period. I use the daily “Done today” entries I write in Evernote, a Python script I wrote last year, the BeautifulSoup Python library, and Voyant Tools to get a holistic look at what I did this year. Voyant Tools allow different views of the data. One is Cirrus word clouds. 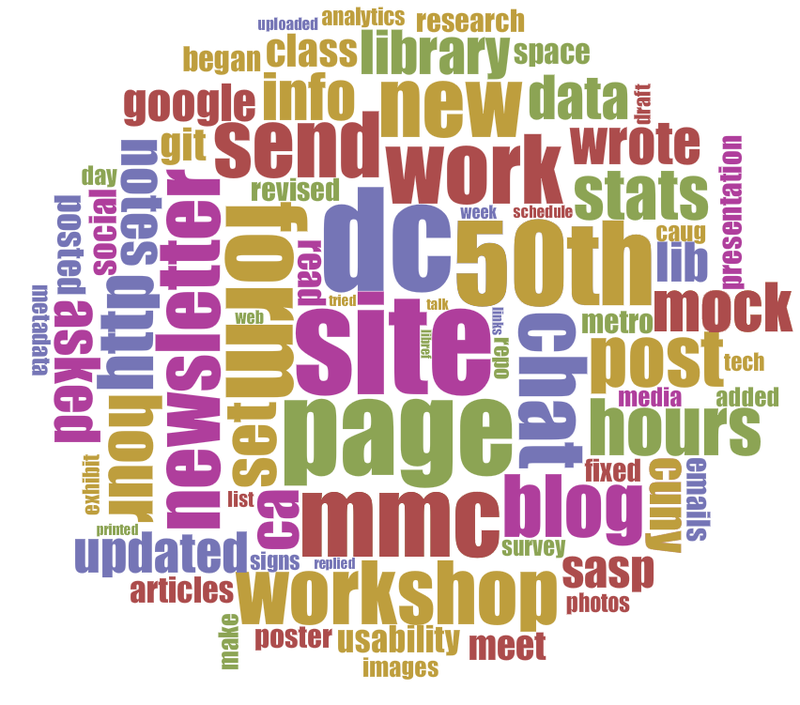 (When used in combo with other data tools, word clouds are useful.) The image at the top of this entry is the word cloud that ignores common stop words, my colleagues’ names, and the words ref, desk, email/s/ed, met, meeting, talked, hr (hour), and sent. I get asked often what it is I do, exactly, and I still don’t have my elevator pitch down pat. I usually choose to view that as a good thing, because I value the freedom to explore new territories and direct my own projects. However, a few recent reads have given me pause, and I’m rethinking my approach to my job as the new semester looms. But first, a general look: what are other emerging tech librarians doing? 41.8% of job ads cite reference as a duty; 72% of librarians reported doing reference work. Similarly, 38.8% of job ads cite info literacy and instruction as a duty; 61% of librarians reported doing instructional work. This aligns with my own experience as an ETL. I never took a reference or instruction class for my MLIS, assuming that I wouldn’t be doing traditional librarianship. Although my job’s description didn’t mention reference/instruction, I’m at the reference desk a few hours a week, and in fact I really value it — otherwise I might not work with students face-to-face at all, which would be a terrible place to start when designing systems and interfaces for them. 23.9% of job ads required skills/experience in social media, web 2.0, and outreach. I’m surprised it’s not a higher percentage. I’m of the opinion that all librarians ought to be familiar with social media. Look, this time last year, I would have rolled my eyes at this — it’s such an old buzzword by now — and yet I’ve seen too many academic people/departments fail to grasp online social etiquette. 94% of librarians surveyed said they needed additional skills in computer programming and coding, versus only 16.4% of job ads requiring those skills and 10.4% preferring them. Yes. I came into my position with years of web experience but minimal programming skills. One thing I’ve enjoyed is the impetus to get up to speed on web tech, Python, and code libraries I might not have otherwise had reason to, but it can be rough playing catch-up so much of the time. Still, looking at numbers and general duties, it’s hard to see what ETLs do. As for me, some of my projects are the usual deliverables — design/upgrade/maintain library website, for example — and others are more playful, like tinkering with Arduino. (You can see a quick summary of my first year’s projects here.) So what exactly are others up to? I suppose that’s what discussion groups, online networks, and excitable conversations are for. And in fact, CUNY librarians, the first Emerging Tech Committee meeting of the year is coming up! But for the ETL to have any value other than as another soon-to-crumble-levy against the technological tide, what is essential is that the position develop a critical stance towards technology. A stance that will benefit libraries, those libraries serve, and hopefully have an effect on the larger societal conversation about technology. […] A critical stance towards technology allows for librarians to act as good stewards not only of public resources but also of public trust. This summer has thrown the imperative of technology criticism into sharp relief for me. At the EMDA Institute, we spent a few days examining how EEBO came to be, perhaps best described in an excellent upcoming JASIST article by Bonnie Mak, “Archaeology of a Digitization.” As a room well-populated with early modern scholars, we thought we knew what it was, but after talking about its invisible labor (TCP), obscured histories (war, microfilm), and problematic remediations, we were struck by how EEBO is just one relatively benign instance of a black box we might use daily. What does it take to really know where your resource comes from, and why it is the way it is? Moreover, the summer of surveillance leaks is exacerbating our collective ignorance of and anxieties about the technologies we rely on every day. I suspect few of us are changing our web habits at all, despite the furor. I talk about it daily, yet I struggle to understand what’s really going on — let alone how I should respond professionally. Originally, I viewed my function at John Jay as a maker, creator, connector of technologies. But technology is never neutral, and I’m starting to see pause and critique as part of my charge, too. When our digital world works, it’s beautiful. When it doesn’t, it’s a black box — a black hole — that can frustrate conspicuously or break invisibly. How can we, for instance, impart to students the level of digital literacy required to understand how a personalized search engine works and how it might fail them, when it so frictionlessly serves up top results they’ll use without scrolling below the fold? Marc Scott penned a popular July blog post titled “Kids can’t use computers… and this is why it should worry you.” I won’t summarize — you should read it. Twice. Librarians have taught students information literacy for a long time. While knowing how to spot a scholarly resource from a dud is essential, understanding systems is now equally necessary, but harder to teach — and harder to grasp, too. So there’s where I am: trying to understand the ethics of being an emerging technologies librarian; overplanning making things and delivering on projects; prioritizing instructing students, colleagues, and peers about things I struggle to comprehend or explain; simultaneously expecting myself to embody a defensive paranoia and a wild exploratory spirit.